While we all need to earn money to survive, equally important is having an enjoyable and healthy life away from work. 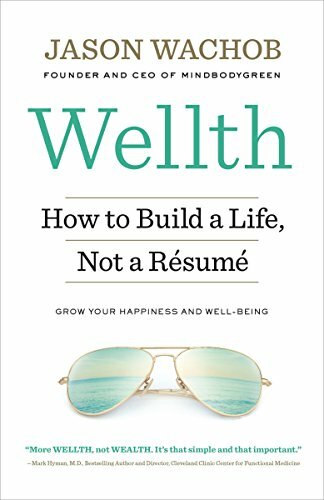 In Wellth, author Jason Wachob looks at various components that make up a happy and well-balanced life. The book is divided into sections such as Eat, Move, Thank, Laugh, etc. The author gives experiences from his own life for each section, and also usually has an expert on the topic give further information. He quotes the doctor and author Aviva Romm's instructions for visualization and justification for why this practice is so important. However, most of these experts are introduced with, "My friend so-and-so . . ." (except for the instances where the quoted expert is his "good friend). There are also small "blurbs" scattered throughout the book from famous authors/speakers (but we are mercifully spared his relationship to them). While there are some words of wisdom throughout the book (mostly in the "Quick Deposit in Your Wellth Account" summary at the end of each chapter), the book is more of a biography of the author and how he got where he is today. The first chapter, Eat, starts out stating that no diet can work for everyone, because we're all different. He then goes on to tell (throughout the entire rest of the book) the way he does things -- although to be fair, he usually gives alternatives in case his way doesn't appeal to you. I just found the book to be too centered on the author, his background, education, business failures and personal life, to be useful to a general audience. For instance, he goes into great detail about a health scare his wife had and includes the sentence, "The next day Colleen's sister Kerry came by to see us with her fiance (now husband) Eric, as well as Tara Stiles and Michael Taylor." Now what possible interest could that be to anyone who isn't personally acquainted with these people??? He also mentions his current business venture many, many times (including on the cover of the book). If you can skim through the ends of each chapter to the "Wellth Account" advice, you'll save a lot of time. 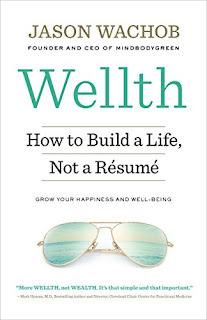 Disclaimer: I received a copy of Wellth from Blogging For Books in exchange for this review.